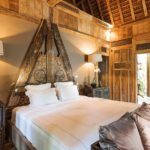 This five-bedroom house in Canggu, Bali is a stunning find. At Villa Zelie, engraved timber doors swing open to reveal sprawling tropical gardens, a shimmering 20-metre swimming pool and inviting spots to socialise or sink into restful peace. Grand open-sided ‘Joglo’ living pavilions and individual air-conditioned bedroom suites are fashioned from teak and ironwood, with architecture inspired by Javanese palaces, and exquisitely furnished with French flair. This entry was posted in bathroom, bedroom, house, outdoor, pool, resort and tagged bathroom, bedroom, house idea, houseidea, outdoor, pool, resort, villa, Villa Zelie on May 3, 2018 by admin.